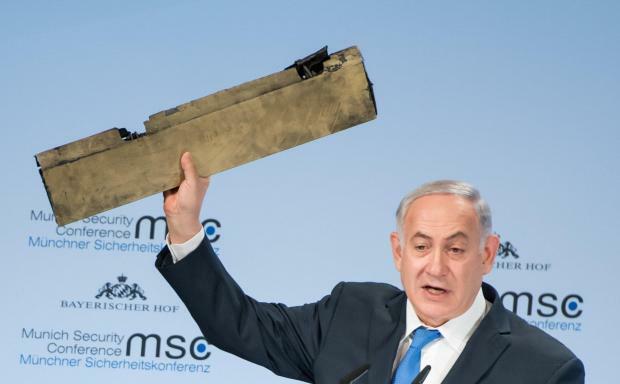 Netanyahu says Israel could act against Iran's "empire"
sraeli Prime Minister Benjamin Netanyahu holds up a remnant of what he said was a piece of Iranian drone which was shot down in Israeli airspace. Iran mocked Netanyahu's tough words, saying Israel's reputation for "invincibility" had crumbled after one of its jets was shot down following a bombing run in Syria. "Israel will not allow the regime to put a noose of terror around our neck," he said. "We will act if necessary not just against Iran's proxies but against Iran itself." For his part, Iran's Foreign Minister, Mohammad Javad Zarif, called Netanyahu's presentation "a cartoonish circus, which does not even deserve a response". "What has happened in the past several days is the so-called invincibility (of Israel) has crumbled," Zarif, who addressed the conference hours after Netanyahu, said, referring to the downing of the Israeli F-16, which crashed in northern Israel after a strike on Syrian air defences. "Once the Syrians have the guts to down one of its planes it's as if a disaster has happened," Zarif said, accusing Israel of using "aggression as a policy against its neighbours" by regularly carrying out incursions into Syria and Lebanon. Netanyahu said that as the Islamic State militant group has lost ground, Iran and its allies were surging into territory, "trying to establish this continuous empire surrounding the Middle East from the south in Yemen but also trying to create a land bridge from Iran to Iraq, Syria, Lebanon and Gaza." The tough words on both sides at the international event come as Israel is increasingly seeking to cooperate with Sunni Arab states that share its worries about Shi'ite Iran. For months, Netanyahu has touted what he describes as unprecedented levels of behind-the-scenes cooperation. Among Israel's main concerns is Lebanon, where the heavily armed Iran-backed Shi'ite militia Hezbollah is part of a coalition government. Israel last fought a war against Hezbollah in 2006. Tension between Israel and Lebanon has increased as Hezbollah has gained strength fighting in Syria, and the two countries also have a maritime border dispute. Lebanon's Defence Minister, Yacoub Riad Sarraf, who spoke after Netanyahu, warned against intervention: "Watch out, we will defend ourselves ... we also have friends." Netanyahu also reiterated his view, shared by U.S. President Donald Trump, that world powers needed to scrap or rewrite the 2015 nuclear accord with Tehran that curbs Iran's nuclear weapons ambitions in return for economic sanctions' relief. "It's time to stop them now," Netanyahu said. "They're aggressive, they are developing ballistic missiles, they're not inspecting, they have a free highway to massive (uranium) enrichment," he said of the fuel needed for nuclear weapons. "If your house is on fire, are you going to refuse to put it out because you are concerned it will light on fire again in 15 years? Or are you going to put it out and use the intervening time to prevent to ever catching fire again?" Kerry said.